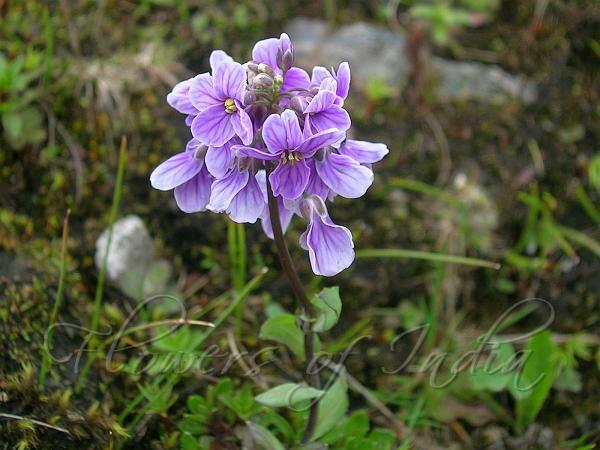 Himalayan Penny-Cress is a perennial, prostrate or upright herb, 7-15 cm long, hairless. Flowering branches have stem-clasping leaves, the non-flowering ones have spoon-shaped, stalked leaves. Leaves on the ground are arranged in a rosette, spoon-shaped, stalked, 1-3 cm long, 4-12 mm broad, margin toothed. Stem leaves of flowering branches are ovate-oblong, 5-10 mm long, 4-8 mm broad, eared at base, stem-clasping. Flowers are borne in 15-20-flowered racemes, up to 4 cm long in fruit. Flowers are 6-7 mm across, white or pinkish, veined in darker color. Sepals are 2-2.5 mm long, about 1.2 mm broad. Petals are 5-6 mm long, about 2.5 mm broad, oblong-obovate. 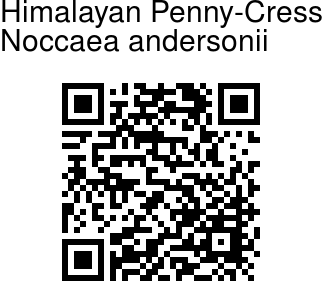 Himalayan Penny-Cress is found on open slopes and damp places in the Himalayas, from Pakistan to SE Tibet and Arunachal Pradesh, at altitudes of 3000-4400 m. Flowering: May-July.